A professional pedometer can monitor heart rate, track your health! 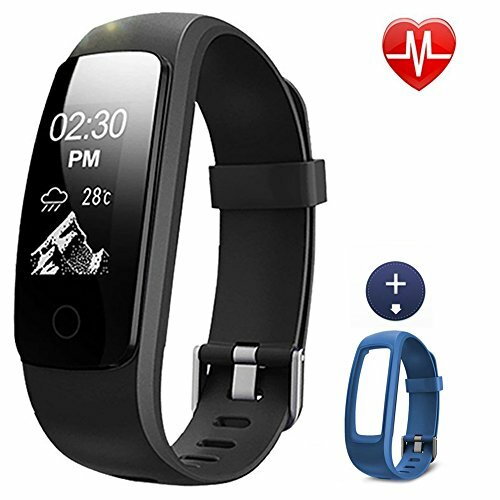 Weather Forecast: Convenient and timely to get the weather information on bracelet. Music Control: free to control your music player in your smartphone. Sedentary Alert: It will vibrate to inform you to do exercise, when you sit for a long time. Alarm Alert: Set alarm on the smart band to wake you up or inform you to do exercise. SNS,SMS and Call Alert: It can receive messages and display the coming calls from phone. Phone calls can be hung up directly from the smartband display. GPS Tracking:: In the walking and running mode, it has GPS to track your sports route. App: VeryFit Pro from Apple or Google store. Waterproof Rating: IP67 Life-level waterproof, sweat-proof, rain-proof, but we don't recommend using it for showering and swimming. 【Don't Need the USB Charger】 Built-in USB simplify the way you charge the activity tracker, just keep the metal chip up and plug the usb part to any universal power adapter, PC or power bank without adapter. 【Updated Health Assistant】Download an app Veryfit Pro in the smartphone, Set a goal for your daily activity, offer 14 sports modes to support your daily workout needs, 24 hours heart rate and sleep quality monitor can help you know yourselves better. 【IP67 Life Waterproof】IP67 Life waterproof can protect your watch from washing face and hands. It can resist sweat absorption. However, don't recommend to wear it for shower or swimming. If you have any questions about this product by Lintelek, contact us by completing and submitting the form below. If you are looking for a specif part number, please include it with your message.